EDITORS NOTE: This is part of a series of interviews, conducted via email, profiling first-time feature directors who have films screening at the 2008 Sundance Film Festival. My name is Terry Kinney and this is my first feature. I was born and raised in Lincoln, Illinois and graduated from Illinois State University , where I met Jeffrey Perry and, later, Gary Sinise. After college we moved to Chicago and co-founded Steppenwolf Theater. I’ve acted in and directed several plays there, as well as many in New York City , where I’ve lived since 1984. Gary, Jeff, and I used to be passionate students films made in the early ’70s. We went over and over to films like “A Woman Under the Influence,” “Scarecrow,” “The Conversation,” etc., and we talked endlessly about how to create that kind of intensity and intimacy on stage. We were far more influenced by film than other theater. We talked in terms of “cuts”, etc., when we plotted stage elements. We scored our plays, and even our lighting, which had a lot of pin-spots and specials, focused action in ways that allowed us to have wide focus or close-ups. The dynamics of film, for us, had more urgency than the way we perceived the language of theater. So we tried to change the language. Have you made other films? I first directed on film with the HBO series, “Oz.” Tom Fontana let me direct two episodes, and it was great training for shooting on a limited budget, on a time crunch. It was all hand-held, super 16, and there were a lot of long scenes with multiple characters- and, also, a lot of scenes that traveled between sets. It required economy, imagination, and clarity. We shot upwards of ten pages a day. And I co-wrote (with Doug Bost, who contributed some great writing to “Diminished Capacity”) and directed a short film last year–an adaptation of Larry Brown‘s short story, “Kubuku Rides.” I started adapting it in a kind of turbulent and dramatic period of time, and found it cathartic, so just continued on–it became the first effort of Steppenwolf Films, which is a new company my co-founders and I, along with our friend Tim Evans, started. A dark and sad little film, which I quite like, about a woman who wants to run away from her life. 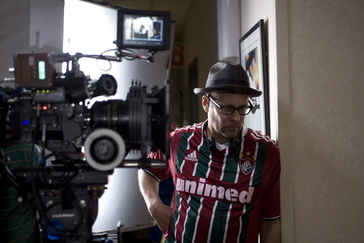 Vanja Cernjul, who shot “Diminished Capacity,” shot the short as well. I feel like being on the other side of the camera was a kind of film school. I trailed a lot of directors, asked DP’s a lot of questions,sat in editing rooms. I’m a late bloomer and decided instead of becoming a “veteran” stage actor/director, I’d try to be a young filmmaker. What prompted the idea for “Diminished Capacity” and how did it evolve? I was sent a script that I didn’t find very interesting or funny, but the agent who sent it encouraged me to read the novel it was based on, which I did–and I found it very charming and hilarious, and loved the characters. I called the writer (who had written the script as well) and asked him why the script wasn’t more like the book. He was relieved, because he’d been misled into that draft. I told him that we had no money, but lots of time and energy, that we wouldn’t give up on it, or him. That was six years, several drafts ago. We went a long way, sometimes out of our way, to come back a short distance correctly–as Edward Albee said. But Sherwood nailed it. Please elaborate a bit on your approach to making the film. I had the advantage of sitting and sculpting the script with Sherwood for long periods of time, which allowed me to configure the look of the film, the beats, some camera angles, right there in the script. We tried to write it as it would look. And the themes of it were simple and universal from the outset. The idea of two sort of peripheral people, both struggling with the loss of their memories, but on separate arcs (one declining, one recovering)- and trying to achieve one simple task that may give them both a chance to be the arbiters of their own destinies– of course they can’t seem to manage that. Also, I have had a propensity for very, very dark material, so I thought it would be an appropriate challenge for my first feature to do a story that is hopeful and sweet-minded, with characters that fall on the side of decent and innocent. And hapless, like the Cubs. But, God forgive me…I love the Cubs! And Matthew, Alan, and Virginia all have that innocence, that sweetness in their acting. The rest of the cast too–Dylan Baker, Bobby Cannavale, Louie CK, Jim True-Frost, Lois Smith, my buddy Jeff Perry>–there is a lot to trust there. Rely upon. Gravitas. Personally, I was refreshed by making choices as a filmmaker that plumbed humanity and good intentions in these characters. It required a good bit of optimism and enthusiasm, which are traits I could use more of, frankly. Terry Kinney, director of “Diminished Capacity.” Image courtesy of the Sundance Film Festival. Aw, developing it, at first, was a kind of blessing. We (Tim Evans, mostly) raised some money from a Producers’ Alliance Tim formed in Chicago . So, the script development was fun and collegial and home-grown. But “shopping it around” was as painful and disheartening as… well, as all independent films have to endure.The script is a balance of humor, romance, and sadness. We were told it wasn’t funny enough,too many jokes, no, more jokes! not sad enough, too damn sad! too edgy, not enough edge. “We need to concentrate on the reality of Rollie’s condition more.” “Rollie’s condition is a downer.” Back and forth, yes, but no. On and on. Celine Rattray of Plum Pictures, five years later, didn’t say any of that. She said, “Let’s do it. Now.” On the way to the table we were supposed to meet at. Of course the challenges come with the territory. Crazy schedule. Too many pages. Long hours. Heat. Money. Money. Money. Locations get lost. Recycling extras. Lord. Thank God I’m a “young” filmmaker. We don’t have distribution. Part of this Sundance thing makes that part of it… very stressful, because it’s a split thing about what you’re here for. But I’m here, decidedly, to see films, show my film, meet filmmakers, swap stories. I’m a perpetual amateur. I work at that. So, I’m here as a student. What are your specific goals for the Sundance Film Festival? See above! I want to locate and explore all the resources that are here for filmmakers, to discuss and listen and debate about film. To see other filmmakers work, to let my to let my film go a bit, hopefully, because my hand is bloody from hanging on to it. I love a lot of films, and like everybody else–I loved “No Country for Old Men,” “There Will Be Blood,” and “The Savages” very recently. In the past couple of years I think the film that really resonated with me the most was “The Beat That My Heart Skipped.” It killed me. It was a filmmaking style I related to and admired the hell out of. The hand held work, the hard cuts. And the performances were remarkable. How do you define success as a filmmaker, and what are your personal goals as a filmmaker going forward? Success for me would be making the film that I actually have in my head, and erasing self-doubt and fear, the kind of fear that allows one to be talked out of impractical or irrational ideas, the kinds of ideas that excite and provoke. My goal is to make my next film be the polar opposite of this one, in terms of tone, theme, and look. I want to serve different story-telling with different palettes. I have confidence that my own sensibilites and world-views will seep through no matter what. If I’m allowed to make films, I can only honor the privilege by fighting for my own ideas. I’m directing a new Neil LaBute play in New York in the spring. Beyond that, I have a couple of film projects I will, like Willy Loman, cart around in my car trunk like carpet samples, stumping for them at every turn. What are your thoughts on the state of independent film today? I am new to the table in the independent world, so I can only idealize its goals with my own- but the market-place isn’t going away. I just think it’s pretty clear that success ,even of the critical and economic bent, is rewarded most often to a singular vision, a new idea, not a shop-worn, tried-and true formula. The independent cinema, at least it seems to me, can hold those ideas without selling them in their dreams first.